Ugandan Knuckles Tribe is one the most entertaining things for a meme lover like me. The internet is a lovely place, full of joy and entertainment. 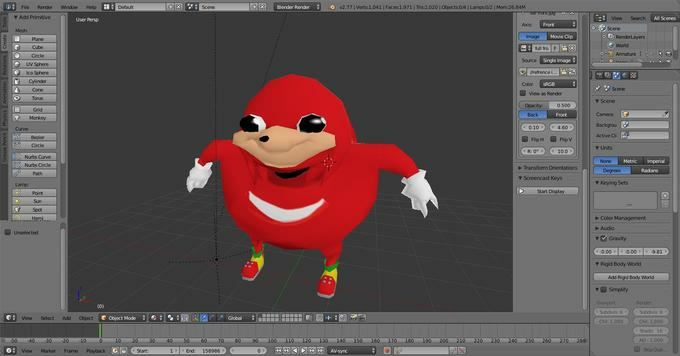 During the last couple of weeks, the VRChat was taken over by personalities who refer to them as Ugandan Knuckles Tribe members. This is all over Reddit and is only gaining momentum from where I am standing. So let us dive in and investigate this phenomenon! One very amazing youtuber (god bless him) on December 22nd uploaded a video which was titled “You Do Not Know The Way”, where a swarm of Knuckles Trible Members (players) with the same avatar were running around and annoying players with clicking noises. While clicking, there were throwing in phrases such as “You Do Not Know The Way” or asking players if “You Know Da Wei”. This is very flat and not interesting, but when collectively it is being performed by 30+ trolls, IT IS HILARIOUS! BTW, the video at this point has almost 5 million views. That is why I called it a phenomenon. This is a platform which was developed by Graham Gaylor (lol, the D is missing). It is still a brand new game, as it was launched on Steam in February 2017, so not older than a year at this point. This social community video game has attracted many players with its possibility to create worlds, design your own avatars or play famous avatars such as Rick and Morty, Spongebob or any Pokemon you want. Due to its broadness or choice and modification options, a large target group was affected and could act as anyone they would love to in the online world. Customizable experience is something businesses are going for, and VRChat is already in the game. Which is pretty cool if you ask me, especially with the growing adaptation of VR, people will definitely use a change to be someone else. For example Ugandan Knuckles Trible member. Want to know more about VRChat? Is the Ugandan Knuckles Creator Proud? Effects of the Ugandan Knuckles Tribe? At the moment Reddit and 4chan are exploding with Ugandan Knuckles Tribe memes, Twitter is going wild and Facebook creates closed groups where people can post their designs, videos, images and just goof around for their own entertainment. This began a week ago and is a huge trend now and I love it! Youtube videos with keywords similar to “Ugandan Knuckles Tribe” are getting more than 5million views at this point, this is more than music stars in some countries. Some people do not agree with this meme and are very much against it. A lot of people are spreading the hate online, yet still causing interest in this whole thing. And I personally do not have anything against this, because people are entertained, smiling and happy doing this. All the videos online are insanely dumb, yet so entertaining to watch and smile on how we as a society have another side of the medal when we are entering the realms of the online world. We are looking at what people are going to do with it, and while on this hype, we at Accidental Factory as well are willing to share the spirit on the Ugandan Knuckles Tribe spirit to you guys. We have put this meme to use for you to wear with pride for your tribe. Check it here!